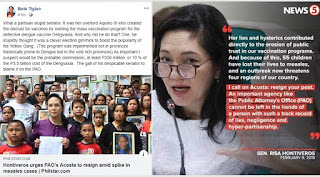 Veteran columnist and former Ambassador Rigoberto "Bobi" Tiglao slammed Sen. Risa Hontiveros for her recent statement calling out Public Attorney's Office Chief Persida Acosta to step down due to the huge spike in measles cases. According to Bobi Tiglao on his Facebook post, Sen. Risa Hontiveros is a partisan stupid senator. It was her overlord Noynoy Aquino III who created the distrust for vaccines by rushing the mass vaccination program for the defective dengue vaccine. Blaming Atty. Acosta, the head of the Public Attorneys Office, who became the face of those allegedly affected by the controversial Dengvaxia dengue vaccine is indeed anomalous. Bobi Tiglao accused Hontiveros of blaming Atty. Acosta, for eroding the public's overall trust on vaccination. What a partisan stupid senator. It was her overlord Aquino III who created the distrust for vaccines by rushing the mass vaccination program for the defective dengue vaccine Dengvaxia. As important I suspect would be the probable commission, at least P350 million, or 10 % of the P3.5 billion cost of the Dengvaxia. The gall of his despicable senator to blame it on the PAO. Senator Risa Hontiveros became one of the first senators from the opposition who issued some harsh statements against Atty. Persida Acosta, to the point, that she even called for the resignation of the head of the Public Attorneys Office.